With its unrivalled range of movement, the Ascend can transfer a patient from a low-seated position to fully extended with ease. 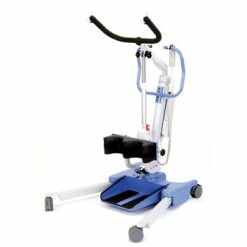 Its active lifting motion was specially designed to encourage user participation, which ultimately promotes patient independence and well-being. Adjustable Knee Pad – The adjustable knee pad ensures optimum resident comfort and support during the lift process. Removable Foot Tray – The removable foot tray allows the Arise to be used as a walking aid, great for residents that need walking rehab or training.